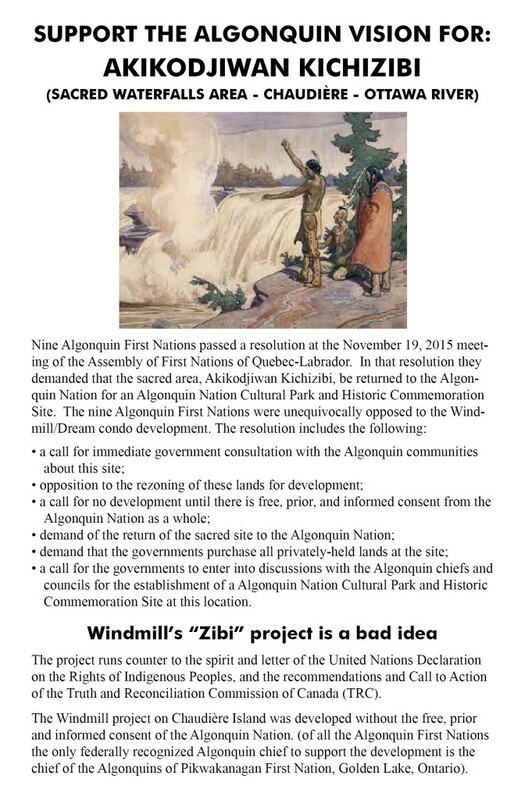 Here are the different emails I’ve had with the Indigenous Affairs (INAC) Minister’s office as well as with the National Capital Commission (NCC), as I wrote to them in support of the demands issued by four Algonquin chiefs in October to protect the sacred site from Windmill Ltd’s pending “Zibi” condo-commercial development at the site, to return the area to Algonquin stewardship and to begin the process of creating an Algonquin cultural and historic centre and park there. and the response I got from the NCC, and my follow-up email to them (cc’ed to local MPs for Ottawa-Centre, Catherine McKenna, and Hull-Aylmer, Greg Fergus). All the email addresses of the relevant parties are included in my messages about the chiefs’ demands, so if you’d like to write your own letters to them please do. Note that the only response I got were from INAC (by phone and email) and from the NCC (by email, and who’ve also indicated they will be responding to my follow-up to them).